Stewart Memorial Presbyterian Church (now Redeemer Missionary Baptist Church) is one of the few Prairie School churches ever constructed. 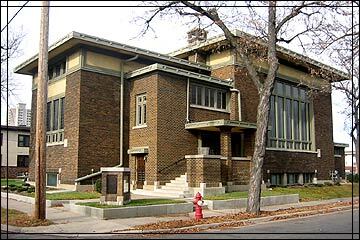 It is considered the first modern church in Minnesota and one of the first progressive structures in the Twin Cities. Purcell's revolutionary design clearly demonstrates Louis Sullivan's adage that "form follows function." With its cubic form, flat roof, large windows, broad eaves, and lack of a steeple, it was an unconventional form for a church at that time. Purcell justified the absence of a bell tower as a way to save money and to imply that modern communication had rendered such a feature obsolete. The small neighborhood congregation held its services at a set time every Sunday, and if emergency information had to be conveyed, it could be done by telephone. The church's cubic form is reflected in the main worship space inside. The square area has a balcony on the south side, as opposed to the conventional cross-shaped nave and transept. This floor plan allowed the entire congregation to be close to the celebrant during the service.